Sometime just after the midpoint of Madeleine Peyroux’s performance Sunday at the Berklee Performance Center, something strange happened: People started leaving. It wasn’t a mass exodus, probably just a dozen or so, but they got out of their seats a few at a time and didn’t return. Two or three times as many did the same before the encore. Maybe they simply decided that Peyroux wasn’t worth hearing anymore. That wasn’t the majority opinion - the remaining audience’s applause was enthusiastic - but there were times when it wasn’t hard to sympathize. 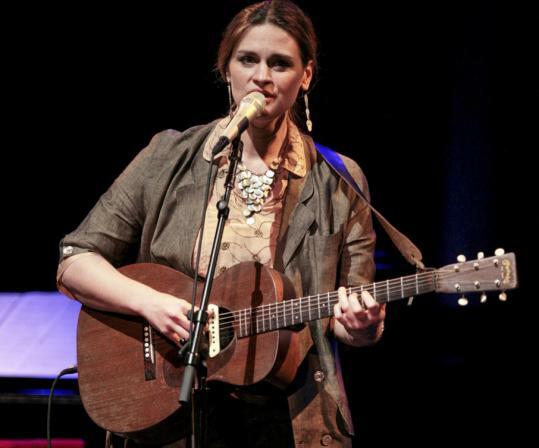 Thanks in part to the timbre of her voice, Peyroux has received plenty of Billie Holiday comparisons over the past 13 years. But Sunday’s performance showcased little more than a few borrowed affectations, like the way she’d slide in her upper register from one note to something approximating the next or start words with a quick dip up or down. In fact, the very real possibility was raised that Peyroux just isn’t a particularly good singer. Her occasionally tenuous connection to pitch meant that when she went for high notes in “Bare Bones,’’ “Don’t Cry Baby,’’ and other songs, her voice was almost painfully off. She alternately stretched and rushed the lyrics to Bob Dylan’s “You’re Gonna Make Me Lonesome When You Go’’ so they bore little resemblance to the original’s rhythm and melody. Maybe that’s why she messed them up at one point. It might have worked if Peyroux were half the jazz singer she tries to be. But she was far more successful with songs in a singer-songwriter vein. “A Little Bit’’ was an effective James Taylor-style shuffle, while the gentle train rhythm and twinkling piano and acoustic guitars of “I Must Be Saved’’ recalled early Shawn Colvin. She also pulled off “Le Temps Du Chanson,’’ a light French waltz colored with mandolin and melodica. But those were exceptions among the genteel jazz numbers on which Peyroux has built her reputation. She closed with Holiday’s skippy, swinging “I Hear Music,’’ ending the evening on the line, “Anytime I think my world is wrong, I get me out of bed and sing this song.’’ She held that last word grandly, on a note that was off. Kelly Joe Phelps opened with a solo acoustic performance of folk and blues. His busily virtuosic finger-picking seemed to offer flourishes without the thread necessary to tie them together into songs.